Melaka Wonderland is approximately 15 minutes from Melaka town, 1.5 hours from Kuala Lumpur International Airport (KLIA), 3 hours from Johor and 4 hours from Singapore. For general information, please contact us at +606 231 3333, 3331, 1119 & 1115. 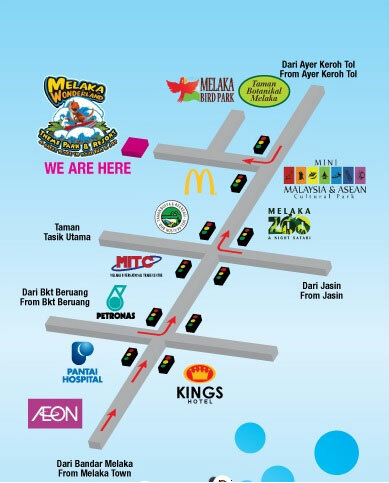 GPS coordinates: N: 2' 16' 51.26" E:102' 17' 39.95"
Like our Facebook page: Melaka Wonderland Theme Park & Resort. Our theme park will be closed every Monday (except during school & public holidays).